Preview version of our cycle analysis toolset out of the cloud. To test and use our preview version, please use the free API Key in your calls. WTT clients get individual keys with unlocked rate limits for individual usage. Our free preview / trial limits are 10 API calls per day and 50 requests per week per user to ensure that the service does not get overloaded and our registered clients don’t get impacted. All our clients and registered API keys get full access to the WTT Cycles API with a limit of 20.000 requests/month. If you need different limits, please contact us via eMail. We issue individual keys on request. We offer code snippets for every endpoint and different platforms. You can find code examples in the toolbox section for each endpoint. 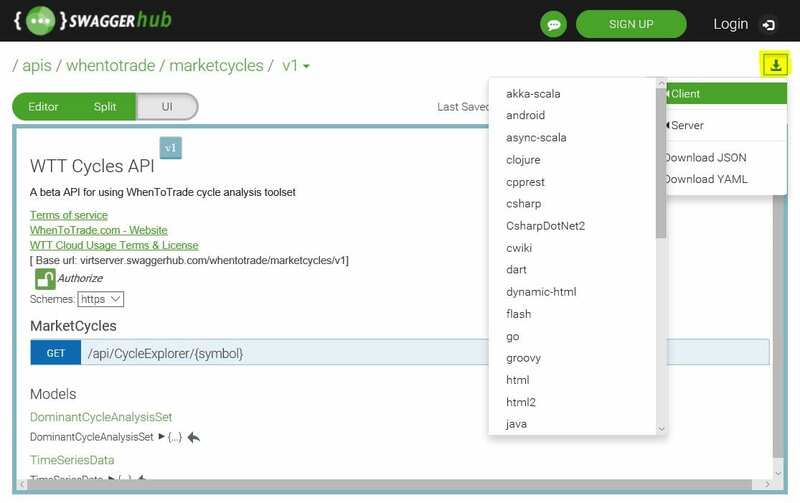 Example code integrations for different charting and tool platforms are provided. Anyone can generate an SDK for our API via our SwaggerHub portal. Open our API page in SwaggerHub. If the API has several versions, select the version you want to use. In the top right corner, click the DOWNLOAD (arrow) button, then select Client and your language or framework. Download and unzip the SDK. I have downloaded the client SDK. Now what? This depends on the language you are using. Usually, an SDK is not designed to work on its own – you will need to create an application that will use this SDK to make API calls. See the README.md file in the downloaded archive to get started. These terms and conditions apply to the WhenToTrade API and any other associated service. Please read these carefully before making use of our services. If you continue to use our services, you confirm that you are agreeing to these terms and conditions. When you register with us, we will allocate you one or more API keys. Those details must be kept as confidential. We can at any point and for any reason disable your account or API access without notice. If you believe that your details have been compromised please contact us and we will update your account details for you. WhenToTrade offers a free service, to prevent abuse and overload our free preview keys are restricted – please do not try and circumvent the limits by creating multiple access points for the same user – please contact us and we can provide extra API keys, or raise your account API limits by registering an official account. The data we provide is intended only as a guide, and is sourced from many different data providers. Our software uses algorithms to process and clean that data and although we make reasonable efforts to ensure data quality you should not rely on the data to be accurate, complete or up to date. You’re not allowed to redistribute or sell the API output or convert it to any other form that people can use. You may not copy, reproduce, republish, upload, post, transmit or distribute the API output in any way or for any other purpose unless you get the prior written permission from WhenToTrade first. No part of the API output may be stored in a database or retrieval system, without the prior written permission of the publisher. The API is designed to help people obtain trading education. our API provides ways to analyze the markets using cycle analysis. There are no warranties implied. The WhenToTrade API makes no guarantee that that you will make money trading any market. We do not take any responsibility for any loss or damage that might occur – for business use or otherwise – from using our API services.